It's that time once again when we take a look at all the wrestling goodness that is about to come our way over the next few days. This week we shall be travelling to Telford on Friday before moving on to Hull on Saturday and finally ending the weekend on Sunday in Stockport. Let's get Ready For The Weekend! We start our wrestling weekend on Friday night as VII Pro Wrestling will be at the Dawley Town Hall in Telford for Summer Blowout 2016. The show will see the crowning of a new number one contender to the British Lions Championship which is currently held by Chris Brookes. The match will be a fatal four-way contest between Dan Moloney, Chris Ridgeway, Damian Dunne and Drew Parker. All four men are worthy challengers to the British Lions Championship and a clear victor is very uncertain. The winner of this match will probably not come down to just pure skills but rather a combination of that skill and opportunity. Regardless of the winner, Brookes has a challenge coming his way in the near future. Another man who is in possession of an opportunity is 'The Bruiserweight' Pete Dunne. This Friday in Telford, the current holder of the VIIth Heaven contract will be in singles action against Travis Banks. Banks is very similar in style to Dunne as in they both hit really hard! Not many many can equal Dunne for his strikes and power but Banks may be one of the few. Dunne shall want to continue his winning ways ahead of his inevitable contract cash-in whenever that may be. Banks on the other hand shall be looking to score a win not only over the VIIth Heaven contract holder but one of the top talents in the UK today. The main event at Summer Blowout came about after Chris Brookes and Kid Lykos of CCK attacked the VII Pro Champion; 'All Day Star' Ryan Smile at the conclusion of Final Inception in April. Since then Smile has been in a rage and has demanded that he face both men this Friday. VII Pro granted Smile the match with the understanding that he have a tag team partner. Smile accepted and found himself a tag team partner in the 2016 New Japan Pro Wrestling Best Of The Super Juniors winner, 'The Aerial Assassin' Will Ospreay. Smile and Ospreay have battled each other in the past but now they join forces to fight the CCK duo, under the tag team name, The Uptown Funkers. Moving on to Saturday and the Hull City Hall will be the venue for New Generation Wrestling's The Eight Year Anniversary event. This show is going to change the future of NGW as a number of matches with big consequences have been announced. Firstly, the long running rivalry between El Ligero and Dara Diablo looks to come to an end when the two look to end things in a Last Man Standing match. These men who were former tag team champions together have been at odds for months with each man attacking the other at various points. However, now things have gotten to a point that this cannot continue and has to be settled with only one man being able to walk away. To end this, both men will have to probably go further than they ever have before and ensure they are the last man standing in Hull. This Saturday will also see the return of the Davey Boy Smith Cup tournament. The Eight Year Anniversary event will see the first match of the tournament take place when 'The Bruiserweight' Pete Dunne faces 'Liverpool’s No.1' Zack Gibson. Gibson won the inaugural cup tournament and was therefore ineligible to be a part of this tournament. However, the Hart-Smith family has decided that Gibson could participate in the open invitational. Gibson shall be looking to show that he is still the number one in this tournament regardless of being ineligible while a win for Dunne over the last winner would send a huge message to everyone involved in the second installment of The Davey Boy Smith Cup. Finally the landscape of NGW will be changed this Saturday and the war between The Control and Team NGW comes to a head in an 8-man tag team match. The Control's Rampage Brown, Caz Crash, Sam Wilder and a fourth competitor shall face Matt Myers, El Ligero, Liam Slater and the current NGW Undisputed Champion; Nathan Cruz. These men have all fought against each other for a long time. This time the stakes have been raised to the highest they can be. If Team NGW win on Saturday The Control will disband. If The Control walk away the winners, then they will take possession of the NGW Undisputed Championship. While difficult to choose the winning side of this match, two factors could come into play in who wins. One is the unknown fourth member of The Control's team after Mark Haskins was forced to withdraw after not being cleared to compete. The second is the fact that Ligero and Myers will be competing for the second time in one night as both men have other matches earlier in the night which is bound to have an effect on "The Mexican Sensation". A lot of variables in this match which will decided how NGW continues after Saturday. 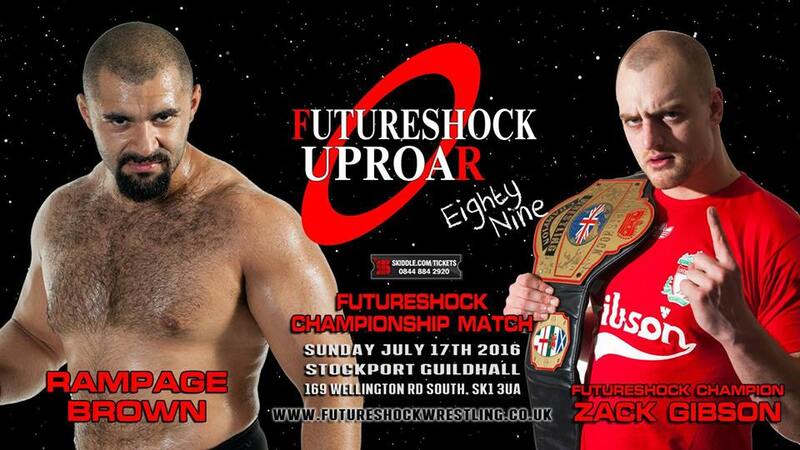 Finally we round of the wrestling weekend in Stockport at the Guild Hall with Futureshock Wrestling Uproar 89. Another stacked night of action from FSW looks to be on the cards here. The first match that was announced for the event included a debut as Little Miss Roxxy makes her first appearance for the promotion when she faces former FSW Women's Champion, April Davids. LMR is a fiery competitor and would love a win on her debut. However she is facing probably one of the most dangerous women in wrestling today in the shape of Davids. The former champion made her return to FSW a few months ago and instantly showed her dominance. At Underground #17 in June, Davids choked Violet Vendetta unconscious after their match. LMR will be aware that she shall have to bring her A-game if she is to avoid a similar fate this Sunday. Also at Underground #17, Zack Gibson and his partner, Cyanide, managed to steal a win from T-Bone and Rampage Brown after Gibson hit T-Bone with a steel chain. That may turn out to be an action that Gibson lives to regret as FSW have announced that Gibson will be defending his FSW Championship against Brown at Uproar 89. Brown is an aggressive heavyweight at the best of times, but now Gibson has angered him even more with his actions the last time they were in a ring together. Gibson may indeed have a talent for winning matches in any way he can, but will that talent be enough to curb the rage and power that Brown will undoubtedly bring with him in Stockport. This Sunday will see another debut as The New Nation's Alexander Henry and Jason Prime will be in action against Don Meacho and Ryan Hendricks of The Uprising. Meacho and Hendricks have been long time players in the FSW tag team division through both talent and cunning actions. New Nation on the other hand have been appearing all over the UK making an impact and they come to FSW with the same goal in mind. The Uprising shall be looking to prove that what has happened in the past won't be happening in the Future(shock) when both teams compete at Uproar 89. Will New Nation show why they're such a hit all over the UK or will The Uprising be a roadblock that New Nation stumble over at the first opportunity?